In 1839 the New York Board of Fire Underwriters was established as an outgrowth of the Mutual Assistance and Bag Corporation which had been formed 36 years earlier. The insurance companies sought to prevent or at least reduce the loss of property caused by fires. Claims by merchants for lost inventory were often due to water damage caused by the fire department as much as by the fire itself. When the Board of Fire Underwriters added actual fire fighting to its methods of preventing losses to insured property, the Fire Patrol was established. 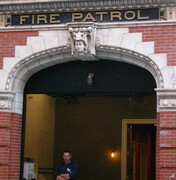 The Fire Patrol was a private organization, distinct from the Fire Department. The Patrol would rush to a fire working side-by-side with fire fighters, laying tarps to protect goods from water , removing goods when possible, and all the while fighting the flames. The success of the Fire Patrol resulted in a third company being formed. In 1894 a new fire patrol house at No. 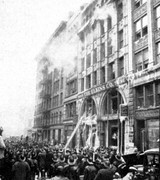 240 West 30th Street in the crime-ridden Tenderloin district began rising. When the Board of Underwriters hired the architectural firm of D’Oench & Simon to design the building, the choice was obvious. Albert F. D’Oench served as an instructor in the first fire fighter training school when it opened in 1892, and was the Superintendent of Buildings. 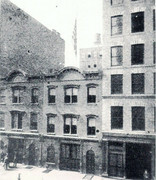 At the time a renewed interest in the Dutch heritage of New York resulted in the appearance of Flemish Revival buildings throughout the city, especially on the Upper West Side. D’Oench & Simon turned to this style for the new Patrol Company No. 3. Completed in September 1895 it rose four stories to an elaborate stepped gable and peaked roof covered in Spanish tile. The ground floor was clad in Indiana limestone and the upper floors were a cream-colored brick. Terra cotta ornamentation included window pediments that changed with each successive floor. The new patrol house was opened with a large ceremony on the evening of September 10, 1895. The Sun reported that “Hundreds of guests of the Fire Patrol Committee of the New York Board of Fire Underwriters viewed the building.” It was a model of up-to-the-minute technology and conveniences. There were accommodations for twenty-six men on the second floor, “each of whom has a separate brass bedstead and a clothes closet,” reported The New York Times. Here too was the private office of the captain. Five sliding poles pierced the floor to enable the patrolmen to rapidly respond to the alarm. One especially clever innovation was the short pole for the driver, located near his bed. When the driver slid down this brass pole, it dropped him conveniently into the seat of the waiting wagon. The third floor included a billiard room and a sitting room for the patrolmen, as well as the superintendent’s office. “Throughout the building great care has been taken to provide for the comfort and convenience of the men,” said The Times. The top floor was designated for workshops and the supply room. Racks for drying the tarps lined the ceiling. Five horses and two patrol wagons—with improved apparatus for quickly reaching fires, said The New York Times--were housed on the first floor. Behind the station was a two-story brick building with feed rooms and a hayloft. “Here are two large box-stalls with a thick flooring of Irish peat, where the horses in turn are allowed a chance to recover from hard runs,” said The Times. Hook and Ladder Company No. 24 was fighting the blaze and Fire Patrol Company 3 was working alongside. When Fire Patrolman Cunningham and Fire Lieutenant Kehoe found her, Mrs. O’Hagan was hanging out of the window. Using a short ladder they reached the fire escape and passed the two children down. But as their portly mother started down, there was a problem. The ladder slipped loose from its fastenings. Along with the 26 fire patrolmen, the captain and the superintendant, Willie was in residence at No. 240 West 30th Street. Willie was a goat. And on February 19, 1903 Willie noticed that the stable door was ajar and he decided to explore the city. As the goat wandered to 6th Avenue a group of boys followed him, some throwing snowballs. Willie, apparently not enjoying the sport, charged the group, knocking one boy down. He moved on to fashionable 5th Avenue. Carriages carrying wealthy residents were rocked and several pedestrians were knocked down by the rampaging goat. “Soon the avenue was in a tumult,” said the newspaper. A crowd of hansom cab drivers and boys with sticks and other weapons attempted to corral the goat. Willie ran to the private entrance to the exclusive Waldorf-Astoria Hotel and the mayhem continued when porters tried to remove him and one was knocked down. Willie’s adventure came to an end when he simply returned to the stable. “No one had been seriously injured,” comforted The Tribune. Prospective fire patrolmen were carefully screened. Because they were constantly in contact with the valuable goods they were trusted to protect, a dishonest patrolmen was definitely not wanted. However in 1909 the Board of Fire Underwriters took a chance on Joseph Carmichael. The man had been in the Catholic Protectory and the House of Refuge “as an incorrigible,” said The Sun, and on June 3 he had been convicted of stealing $60 worth of jewelry and $30.50 in cash from Charles W. Gould. But his sentence had been suspended and he was accepted as a fire patrolman. Unfortunately, becoming a fire patrolman did not chance his habits. Three days before Christmas that year Carmichael stayed back while the company rushed to a fire. When the men returned, David H. Drought noticed his gold watch and chain was missing from his locker. Carmichael confessed and was arrested, promising to return the watch. The arresting detective waited while Carmichael received the 14-pound turkey that the Board of Underwriters gave to every fire patrolman for Christmas. They then proceeded to his mother’s house on Lexington Avenue. Mrs. Carmichael received a Christmas turkey, Fire Patrolman Drought received his watch, and Carmichael received a jail sentence. Throughout the years Fire Patrol No. 3 continued to go beyond the mere protection of insured goods from water and fire. On September 22, 1915 a massive explosion in the nearby 7th Avenue subway resulted in the collapse of the street for blocks. Subway passengers were trapped beneath the rubble and dozens of motorists and pedestrians fell into the chasm including a passenger-filled trolley car. In 1916 Irving Crump supplied an eye witness account of the dangers the Fire Patrol encountered. “White coated men wearing red fire helmets were working about in the glare of the rays from the searchlight engine. I learned later that they were the men of the Fire Patrol, and that they were busy saving property in the warehouse. When Crump asked what the patrolmen were doing, he was told that there were barrels of gasoline and motion picture film in the building which presented a potential disaster. But even as the explanation was being given, the worst of the patrol’s fears became reality—the remaining gasoline barrels exploded. The same year Sergeant William S. Cashman was on the scene of a fire at No. 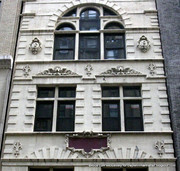 347 West 38th Street. 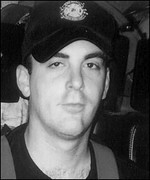 Fireman Harry J. Murphy of Engine Company No. 26 fell through the floor, landing unconscious in the cellar of the burning building. Cashman rushed in, pulling the fireman to the safety of the street, saving his life. A year later he was awarded the Fire Underwriters’ life saving medal. The gold medal “goes only to those who have performed feats of signal bravery,” said The Sun. The unit was later renamed Fire Patrol #1 and at some point during the 20th century the handsome Flemish Revival gable and peaked roof were removed, to be replaced by a stepped parapet and flat roof. The building was decommissioned in 2006. Today the first two floors, where fire patrolmen slid down brass poles and horse-drawn wagons awaited the alarm, are home to a nightclub. And although someone thought it would be a good idea to cover the brick, terra cotta and limestone with white paint, the building retains its handsome architectural integrity—even with the loss of the wonderful gable. 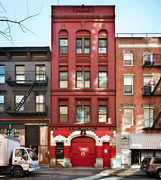 FP 3's initial response district was 23rd St to 57th St.
Was horse stable before FP 2 firehouse. Division 17 covered the Bedford-Stuyvesant and Bushwick neighborhoods of Brooklyn during the 'War Years' from quarters with Engine 252. It was a split of mostly Division 15, and three of its battalions were created to assist with the workload of Battalion 34 and 37. Is there a Unit Location Chart available or perhaps already posted somewhere that corresponds with the 1971 map of the sixteen divisions? Note - Bn 55 and Bn 56 in Bronx and Bn 59 were assigned administrative boundaries by 1973. Battalion 60 had no administrative boundary and rotated to different Brooklyn battalions and operated as a 2nd section during tour. ^^^^Take me back ! ....a great time. ^^^^^^ Thank the Lord that even a few of us in those pictures above still can walk His Earth....Continued Rest In Peace To The Rest.